Carl Vine has been firmly established as one of Australia's leading composers for some years now although in the U.K. his name may be most familiar to many for his orchestral work, Descent, which figured as a finalist in the very first Masterprize competition several years ago. 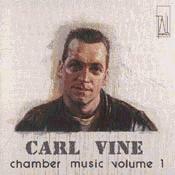 This first volume in Tall Poppies' anthology of his chamber music concentrates on the years 1983 to 1990, as Vine's reputation was growing. It contrasts a number of works for ensemble, including those specially written for Flederman, the contemporary music group of which Vine was a co-founder, with the Piano Sonata and two solo works with electronic tape. The Piano Sonata No. 2 appears on volume 2. Although works such as Café Concertino are built around specific harmonic cells and their derivations, Vine's principal pre-occupation in the early 1980s was rhythm. Most of these works employ a high degree of rhythmic structure and complexity. Intricate contrapuntal lines, passages of motoric velocity and elaborate cross-rhythmic constructions push the virtuosity of the players to a considerable degree. This is evident from the opening bars of Café Concertino, a work that neatly captures the essence of Vine's work at the time and has become one of his best-known pieces. Centred around a fundamentally simple cycle of fifths that Vine then subjects to an involved process of elaboration and expansion the piece is cast in four continuous but clearly discernable sections. It is scored for flute, clarinet, violin, viola, cello and piano. Even in the slower passages the rhythmic obsession remains. As with all of these pieces the overall language is approachable and although often tonally ambiguous the music remains basically rooted in harmonic and melodic consonance. The performance given here by the Australia Ensemble has all of the momentum and rhythmic clarity expected from an ensemble that must be more than familiar with the composer's work. The other two ensemble works featured, Miniature III for flute, trombone, piano and percussion and Elegy for flute, cello, trombone, two percussion, piano and organ explore similar aural territory but are ultimately quite different in character. Vine has the advantage of knowing the players of Flederman intimately and Miniature III was written for them on a personal level, very much in the mould of a virtuoso showpiece. There is certainly some fine individual playing, the three continuous sections effectively showcasing the players and introducing some taxing rhythmic challenges once again. Elegy explores a different world, written in response to the sudden death of a close friend of the composer. This is the toughest of the ensemble pieces to access, clearly personal and emotionally wide ranging in its juxtaposition of violent outbursts of anger, questioning moments of repose and gentle beauty. It is in the Piano Sonata with which the disc opens however that Vine is at his most impressive. A virtuoso pianist himself he clearly writes both challengingly and effectively for the instrument. Loosely based around the structure of Elliot Carter's 1946 Piano Sonata, the work is in two substantial movements. These are, in effect, the opposite of one another, the first slow-fast-quick, the second fast-slow-fast. Once again rhythm is the driving force yet allied to this Vine gives the piece a harmonic and melodic cohesion that stems from the audible and logical working out of his basic material. Michael Kieran Harvey gives a dazzling display of pianistic fireworks in the densest passages of polyphony and is admirably nimble in the breathless moto perpetuo of the second movement. Alongside a work as impressive as this the shorter pieces featuring electronic tape, one with trombone and the other with solo percussion, are disappointing. Simone de Haan is a competent soloist in the lyrical, stratospheric trombone lines of Love Song. There is percussion writing of interest in the Concerto (this work also exists in a version for percussion and orchestra). However the somewhat banal part for tape, a mostly dated sounding amalgam of synthesised sounds, leaves little impression. Something of a mixed bag overall then but the real evidence of Vineís talent lies in the striking Piano Sonata followed by the energetic Café Concertino and Miniature III.